“Join the world’s largest treasure hunt” is the quote on the geocaching.com website. There are approximately 2.8 million geocaches worldwide. People from all walks of life, cultures and backgrounds enjoy finding and creating geocaches. A community of 10 million people worldwide enjoy this engaging sport. If you love games, exploring and adventure, you will probably want to add this game to your list of activities to try. 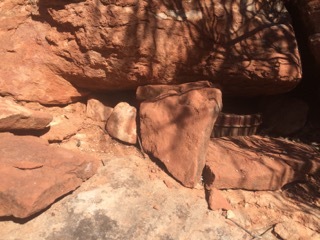 Geocache tin hidden in rocks on the Jim Thompson Trail near the Village of Oak Creek by Sedona, AZ. As the website shows, geocaches can be all around you, and you would never know they are there unless you are a registered participant of the geocache website. Geocaching can be done individually or as a group. You can find geocaches in your city or out in the wilderness on hikes and camping trips. We have found geocaches in the most amazing and unsuspected places. We have geocached in Alaska, Europe, the British Virgin Islands, Taiwan, throughout Arizona and of course our town of Flagstaff. When my husband and I travel, we do geocaches. Geocaching is one of our favorite hobbies, and there has never been a dull moment when we play this game! What is a geocache? Basically, it is a modern-day treasure hunt. People hide “treasures” or knickknacks such as children’s action figures, small crossword puzzle books, dollar bills, coins, mementos, small toys, miniature games, little balls, jacks, playing cards, etc. “Treasures” are placed in some sort of sturdy outdoor container such as an old army ammo box, a tin can or some sort of sturdy plastic container that can withstand the elements. The goal is for every geocache to start with treasures inside of it. Once the geocache is found, the finders can take part of the treasure if they leave their own treasure. In other words, you can take a piece of the “treasure” if you leave some new piece of “treasure” of you own. Every geocache has a logbook and pen or pencil located inside the container for you to date your discovery. You can also record what you take and what you leave behind. After logging your information, taking a piece of the treasure and adding your own treasure to the geocache, you rehide the geocache in the exact location where you discovered it. When geocache is created and hidden, it’s location is given gps (global positioning system) coordinates. These coordinates are found on the website and put into your gps, your geocache phone app or phone map app. You then follow the coordinates to the geocache sight. It is easy and fun! Try it – you will like it is how the saying goes! And don’t forget that Team Tait sent you on this wild and adventurous “treasure hunt”! 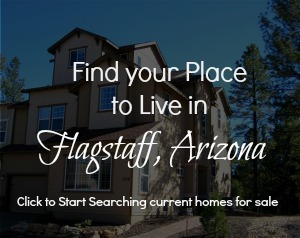 Posted in About Flagstaff, Adventures, Places to Play and tagged Family Fun, Flagstaff Neighborhood Activity, Fun in Flagstaff, Geocaching adventure, Living in Flagstaff, Things to Do.